This is a ceramic container of a variety known as Clearwater Lake Punctate. It was found on Whitefish Island on Amisk Lake, Saskatchewan in the 1950's by Gina Sewap, of the local Cree First Nation. Its distinctive features include an encircling ring of exterior punctates which raise interior bosses, located just below an everted lip. 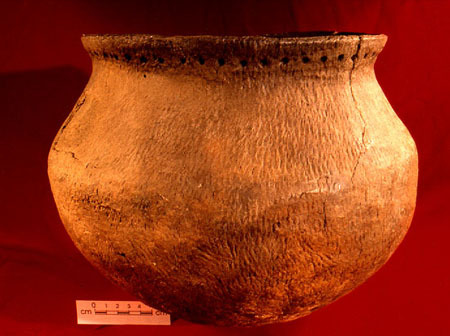 The body of the pot is textured with cord or textile impressions. Pots of this variety are found over a wide area including parts of Eastern Saskatchewan, Manitoba and Northwestern Ontario. They were being made during the late prehistoric period, dated to between 250 and 1100 years ago. These ceramics are believed to be ancestral to the Cree people of that region. This specimen was kindly loaned for this exhibit by the Manitoba Museum of Man and Nature. See references for Exhibit Specimen 5.